I don't normally read biographies, and I before I picked up my review copy of this book I admit to knowing nothing at all about José Arguelles. 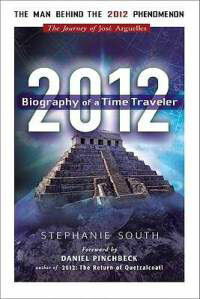 What interested me was whether there would be any new theories about the meaning of 2012 in the book. José Arguelles is an art historian with a PhD whose immersion into New Age philosophy put him into the forefront of the beatnik/hippie movement. He has lived what is undeniably a very colourful life. His career's bi-polar highs and lows match the volatility of his private life. His theoretical musings are certainly out there, and are founded upon a lifelong study of Buddhism and meditation practice. His occasional association with communes, and his desire to break free from the rat race of Western life, put him at odds, refreshingly, with the more usual New Age evangelical trend towards embracing money-generation and right-wing politics. So, he's a curious fellow, and that makes for a fascinating biography. It helps considerably that the author, Stephanie South, is a very capable writer, and the book has been well-researched and written. On a presentational level, the only criticism I would have is the quality of the photographs supplied by the 'José Arguelles Archive' - which sounds a bit like one of the libraries set up by ex-Presidents of the United States. This kind of pretension is something that, unfortunately, runs through the book, like the frequent listing of presumably notable people whom I had never heard of. I waited a long time to find out what it was about this chap that I should be sitting up and taking notice about. The scientific part of me cringes to read this, but the artistic side of me is impressed. José Arguelles is a visionary, and a capable avant garde artist. He founded the Whole Earth Festival in California, and was an early environmentalist long before Global Warming became an issue. He also lives the life he advocates, which is a rare quality. The biography covers his life up until the early nineties, during which he married several times, and brought up a family. During those early years he battled with alcoholism, and occasionally experimented with psychedelic drugs. He worked within establishment academia for about twenty years, and was formally part of the Buddhist community. As his children grew up and left home (and suffered tragedy), he also fled the nest of (relative) normality, eventually ending up in makeshift digs in Hawaii. Using Hawaii as a base, he travelled extensively promoting his philosophies and his Dreamspell concept. Personally, I can relate to him as a person a fair bit. He has moments of great inspiration and motivation, mixed with long periods languishing in a myre of lost opportunities and frustration. He often indulged in escapism, but at times also bravely pushed the boundaries of acceptable action. He has involved himself as a founder member of countless fledgling organisations which idealistically strove to change an indifferent world. He understands and supports the struggles of many indigenous peoples. Centrally, his lifelong passion is a belief that art can change the world - the true artist facilitating change almost akin to Plato's Philosopher King. Establishment art, by contrast, is often guilty of intellectual fraud. Maybe 2012 offers an opportunity for his artistic vision to take a beleaguered humanity in a positive direction. Promoting such an ideal is a battle that is on-going for José and his companions, although, frustratingly, one will need to get hold of the second half of this two book biography to read in detail about their progress over the last 15 years. Taken as a whole, the biography is likely to act as a 2-volume resumé promoting José Arguelles as the 2012 Guru of Choice. He has certainly attracted the attention of many notable New Age proponents in our broader culture, like Shirley MacLaine, and Jon Anderson of 'Yes'. I will be watching with interest what role José Arguelles will play in the run-up to 2012. Subtitled: "The Journey of José Arguelles"